California Games / Jogos de Verão - USA All sides - Scans - SMS Power! Hey Dude, get ready for the ultimate in rad video! 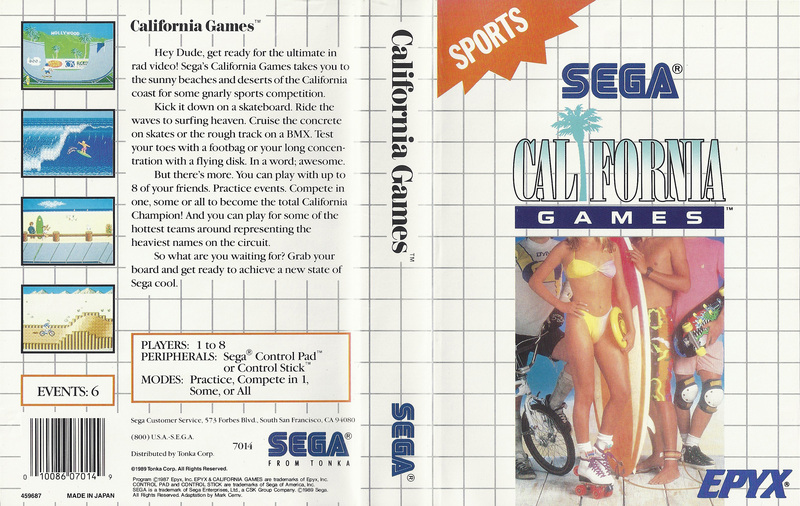 Sega's California Games takes you to the sunny beaches and deserts of the California coast for some gnarly sports action. Kick it down on the skateboard. Ride the waves to surfing heaven. Cruise the concrete on skates on the rough track on a BMX. Test your toes with a footbag or your long concentration with a flying disk. In a word; awesome. But there's more. You can play with up to 8 of your friends. Practice events. Compete in one, some or all to become the total California Champion! And you can play for some of the hottest teams around representing the heaviest names on the circuit.